Unresolved workplace conflicts can damage relationships and careers. Unforgiveness is often birthed out of miscommunication, misperceptions, assumptions, unmet expectations and different personality styles. If left to simmer, unforgiveness can easily morph into the ugliness of hate and resentment. It takes a highly self-aware leader to identify and solve relationship issues that lead to unforgiveness. During our years of coaching Fortune 500 leaders and high potentials, we have witnessed people respond to their offenders in a variety of ways: purposely withholding crucial information, less cooperation, vengeful actions, disengagement from teams and more. Like a stone thrown into a pond, unforgiveness creates a ripple effect that touches many others in your organization and personal life. Before you refuse to forgive someone at work, consider the professional and personal costs. Studies show unforgiveness is linked to increased absenteeism, higher stress levels, mental health problems, lower productivity, lower self-esteem, aggressive behavior, increased bitterness and more. Unforgiveness is the ultimate hostage taker because it loads your mind and body down with the deadly force of stress and anger. Studies at The Johns Hopkins Hospital reveal that chronic anger activates your flight-or fight mode. It causes you to have an increased heart rate, blood pressure and also impacts your immune system. In turn, these changes can increase your risk of depression, heart disease and other health conditions. Clearly, when your mental or physical well-being is compromised so is your ability to effectively lead and contribute at work. Forgiveness is the key to restoring workplace relationships. Indian activist Mahatma Gandhi famously said, “The weak can never forgive. 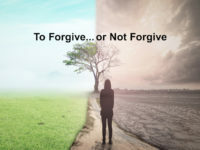 Forgiveness is the attribute of the strong.” Ross Elkins is the Corporate HR Manager for a Houston-based energy company and he knows well it takes inner strength and time to forgive co-workers. Ross recalls years ago when he came face-to-face with this issue after an embarrassing encounter with his then-boss, “She mistakenly thought I had missed a deadline, so she screamed at me in front of dozens of people in an open-air workspace, yelling, ‘What kind of idiot are you?’”. You can imagine the hush that fell over the group. Ross was embarrassed and felt very disrespected. “I asked her to step into a nearby huddle room to discuss the matter in private,” he says. As you might imagine, there was an uneasy silence between the two for a time. Time plays a key role in forgiving someone who has wronged you. As an emotional being you need time to process and work through things before you are ready to forgive. “First, I needed time to cool down,” Ross recalls. “Then, I talked about what had happened with some trusted colleagues and friends,” he adds. Venting to people you trust helps you release your frustrations and think things through. “I came to the conclusion that holding a grudge toward my boss would only weigh me down and I didn’t want to carry that weight around at work or home,” says Ross. Therefore, after a couple of weeks he made a conscious choice to forgive his boss. Then, they were able to communicate normally again, and he felt the heavy weight was released. Forgiveness plays a key role in resolving workplace conflicts. Former USA President, John F. Kennedy was known for his charismatic leadership style and solid communication skills. When asked about conflict resolution strategies, he once said, “Forgive your enemies, but never forget their names.” American songwriter Willie Nelson penned similar thoughts in a song that says, “Forgiving you was easy, but forgetting seems to take the longest time.” Cheryl Ramirez has been an HR leader with several Fortune 500 groups during her career and today she is Director of Talent Development for an Oklahoma-based organization. She believes the topic of forgiveness is crucial in today’s workplace and admits she has been on both the giving and receiving end of it. Cheryl recalls facing this after she left a utility company to take a position with her current employer in Oklahoma City. Shortly after leaving the utility, her former boss called to admit something. “Evidently, his guilt was eating at him,” she recalls. “He admitted he had thrown me under the bus when I left the utility by blaming me for something that had gone wrong,” Cheryl says. “At first, I just tried to laugh it off, but I was hurt, mad and I was not in a place to forgive.” For the next year and a half, she avoided her former boss’s phone calls, blocked his numbers and worried about running into him at restaurants and other local venues. Then, while working with a leadership coach she had an important realization. “I am a big believer in what Maya Angelou says about forgiveness – that it is a gift you give yourself. I knew I needed to free myself,” Cheryl says. She called her former boss and asked to meet to discuss what he had done to her. At last, she was free! Conflict resolution skills add value to your relationships and career. You have several choices to consider when you feel wronged by someone at work. Do you forgive? When do you forgive? How do you forgive? Is there a way to restore wholeness or justice to the damaged relationship? Angel Stacy is Director of HR for a company with employees in more than sixteen states. During her career she has counseled many leaders and employees who get caught up in workplace offenses. “I think today we live in such as fast-paced world where technology makes us even more impatient,” says Angel. “We are in a constant hurry to get things done – a frantic mode of do, do, do,” she adds. Angel believes this frenetic pace causes people to speak before they think, and this is why better communication skills are crucial to helping people increase their awareness about how their words are going to impact co-workers. “This is one reason why we are rolling out a new initiative in 2019 around civility in the workplace,” says Angel. “People need to be more civil to one another. At the same time, those who get offended need better awareness and listening skills to really think about the true intent of their co-worker’s comments,” she says. Angel says stronger communication and listening skills do help most people discover their co-worker’s comments are not typically meant as harmful or malicious. “People often rush to judgement and everyone just needs to slow down and strive for civility.” says Angel. Communication skills and leadership skills play a key role in conflict resolution. As leadership and communication coaches for Fortune 500 groups we often think “if only” people had learned better communication and problem-solving skills when they were growing up. That leads to the question: what are schools doing to provide stronger soft skills for tomorrow’s workforce? “It is very important that kids learn to take responsibility for their communication and actions,” according to Annie Tronnes, MS, NCSP, a school psychologist in San Carlos, California. Annie and her team are helping kids improve their conflict resolution and communication skills by using something they call restorative justice. “We think it is important for the kids involved in hurtful actions or conflicts to have a voice in how they resolve conflicts and restore relationships,” says Annie. Annie shares a story about the time a child in her school took all of the paper towels in the restroom and dumped them on the floor. But, instead of the teachers or administrators telling him what he did was wrong and sending him home for the day, he got to hear from several people who were directly impacted by his actions. “The janitor shared how the ruined towels affected his budget and job,” says Annie. “The child also heard from several kids who had no way to dry their hands after the incident,” she adds. In the end, the child at the center of this offense was asked how he could bring justice to the situation and restore his relationships. “He chose to work with the janitor after school for a couple of days to make things right. This gave him the opportunity to think and see the world from new perspectives – an invaluable soft skill that will serve him throughout his life,” says Annie. We hope you found this information on conflict resolution and communication skills to be very helpful! Our team helps leaders and organizations transform their potential with better leadership soft skills and communication strategies to achieve stronger business results. If you need help transforming your people, give us a call or send us a quick note.